Didn’t care for Marilyn Manson? Pomona’s Fox Theater swings to the other extreme Sunday with opera. 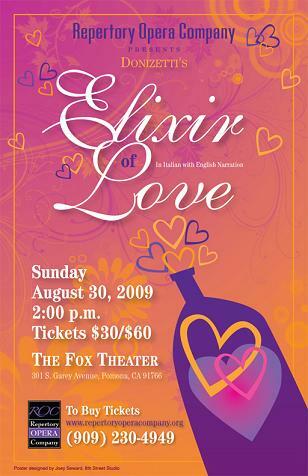 Donizetti’s “Elixir of Love” will be featured in one performance only at 2 p.m. Sunday. The production is by the Repertory Opera Company, which is based in Pomona and performed “Don Pasquale” at a Pomona church last year. “There is a possibility that we will do a full season at the Pomona Fox Theater, but it is contingent upon how well this show does,” artistic director LizBeth Lucca says. Put on your fur coat, screw your monocle into place and journey to downtown Pomona. If nothing else, the parking is cheaper than at the Dorothy Chandler Pavilion. What should be so surprising about opera in Pomona? Some intellectuals live there. I think its a great idea and all part of the arts district. Pomona needs an antidote to the Manson crowd. Better watch your email, however, because you might hear from PETA. Personally, I wouldnt wear one of my furs on Sunday, anyway, because it will probably be 103 degrees. Oops! Dont give PETA my email. This effort, though simple by grand opera standards, is the beginning of broadening Pomona’s cultural offerings which bodes well for all representative fine arts. These Repertory Opera folk are quite skilled and have good drama chops. I hope the serious word on the street is that Sunday afternoon at the opera is the place to be! I’ll be there.